For most of us, birthdays are an exciting time. Another year of life experienced and a fantastic opportunity to celebrate with close friends and family. 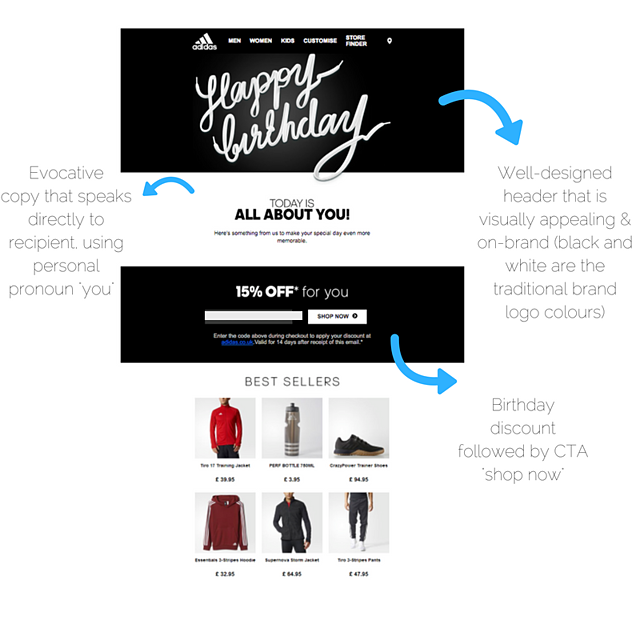 So, why aren't retailers using their customers' day of celebration in campaigns more? Retailers getting in touch with shoppers on their birthdays is nothing new, but still not as readily exercised as it should be. Everyone wants to feel special on their big day, so making sure your birthday email are as personalised as possible can be a big win - generic birthday greetings won’t cut it for long; by using customer behavioural data you can really advance the campaigns you're sending to customer - it's essential to maximise what you know about them to create experiences that they'll truly love. With Ometria recently celebrating its 6th birthday, we looked back at birthday emails we've received over the past year to come up with a list of good examples (and we've made some advanced suggestions about how they could be improved, too). For more in-depth tips on advancing your automated campaigns, read our guide which breaks down the 8 campaigns you should be sending and how to perfect them. 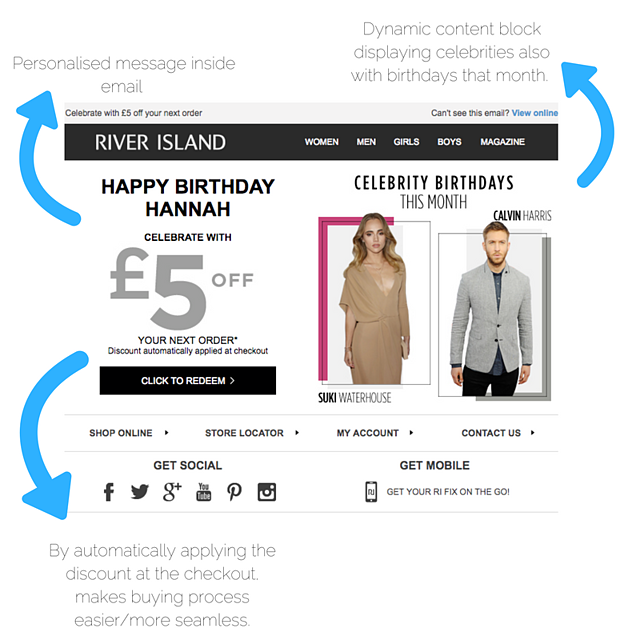 Segment your campaign or use dynamic content to change up the incentives you send, based on lifecycle stage (e.g. sending your VIPs an extra special gift, or increasing the incentive for those who are yet to purchase for the first time), gender, or other demographic factors. This email from New York City-based online monthly subscription service Birchbox is certainly bursting with energy. The pun-filled, lively copy and birthday themed CTA manage to create the level of excitement every recipient wants to see on their birthday. The “best sellers” product recommendations are great incentives to encourage spend and the subtle but clever condition that you have to spend at least £30 to use the promo code is an interesting way to boost the campaign’s overall revenue potential. Idea 🎈 Using a personalised product recommendation engine, you can tailor both your incentive and your recommendations according to your recipient's spending habits and taste profile. This is likely to increase the chances of your email converting, or just bringing about a "click". This email from M&Co was our favourite birthday email, just for its sheer personalisation. 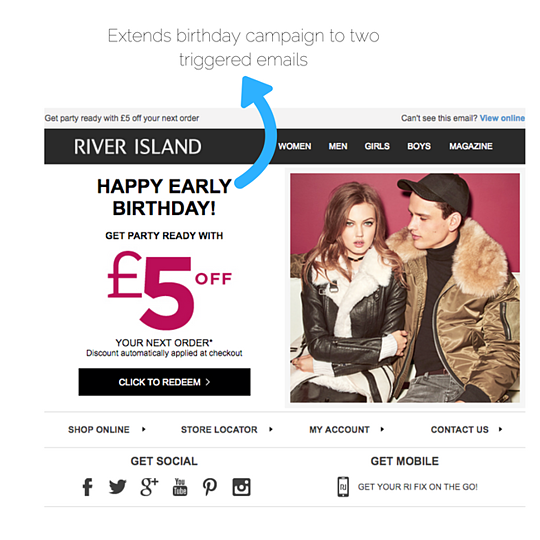 The brand uses the recipient’s name in both the subject line and body of the email, making the overall message seem more genuine and less automated.We love how the email provides the option for birthday shoppers to use the voucher offline, helpfully including a store finder button. Nobody does "chic" quite like Chanel. Keeping things sophisticated, the French fashion legend opts for a pretty, colourful gif accompanied by the short and sweet copy: "Chanel wishes you a wonderful birthday" in this automated birthday email. Whilst the message definitely makes a strong impression (as many brands aren't yet even sending anniversary emails), the email would have seemed even more special if it had incorporated the recipient's name, and other forms of personalisation, reflecting the treatment they would receive as a customer in-store. Idea 🎈 Luxury brands tend to steer clear of discounts, but there are other ways they can use data to treat their most loyal customers in a bespoke way. For example, sending a handwritten card and gift in the post, or offering exclusive access to a one-off event. The copy is informal and warm, addressing a recipient like a close friend; for example: “Go on, spoil yourself. It’s our treat”. 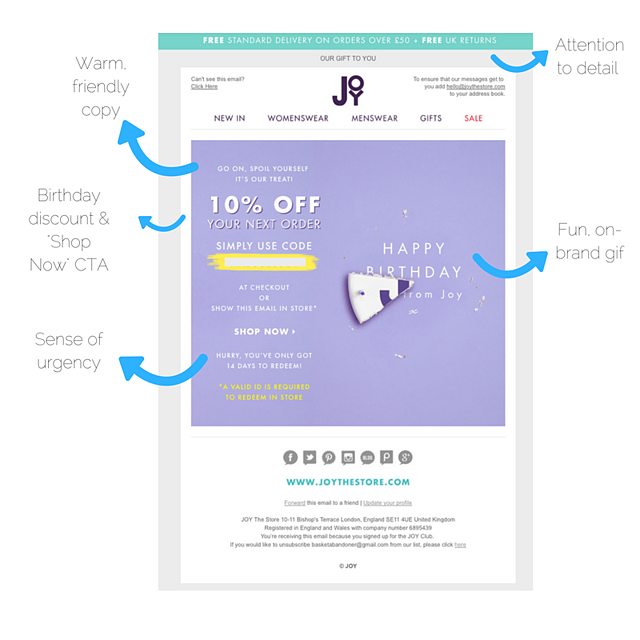 Just like the majority of the emails in this post, JOY includes a birthday discount (10% off). However, unlike other examples, the brand manages to create a sense of urgency by informing a recipient to “hurry” as they only have two weeks to redeem the discount. 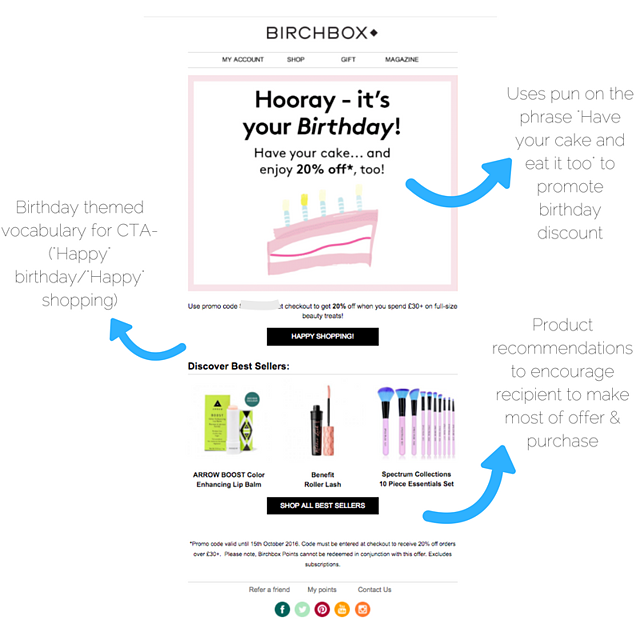 Idea 🎈If you have a good idea of what your customers like or dislike, try including dynamic product recommendations in your birthday emails to give recipients some inspiration on what they could spend their discount on. You can learn all about the different product recommendations available to retailers here. River Island’s “early” birthday email is a genius idea; sent just before Christmas, this seasonal message will have anyone born in winter feel extra special. The best thing about the actual birthday email is obviously the dynamic content blocks showing “celebrity birthdays this month”. By choosing young and fashionable style icons, this free content is bound to go down well with any River Island shopper. Using the recipient’s name in the body of the email also wins brownie points. 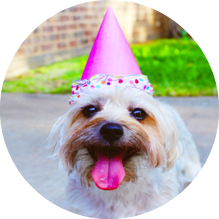 Idea 🎈If a customer regularly engages with your content (for example, your blog), include some special birthday ideas in your birthday email. For example: "5 spots in London to celebrate your birthday". 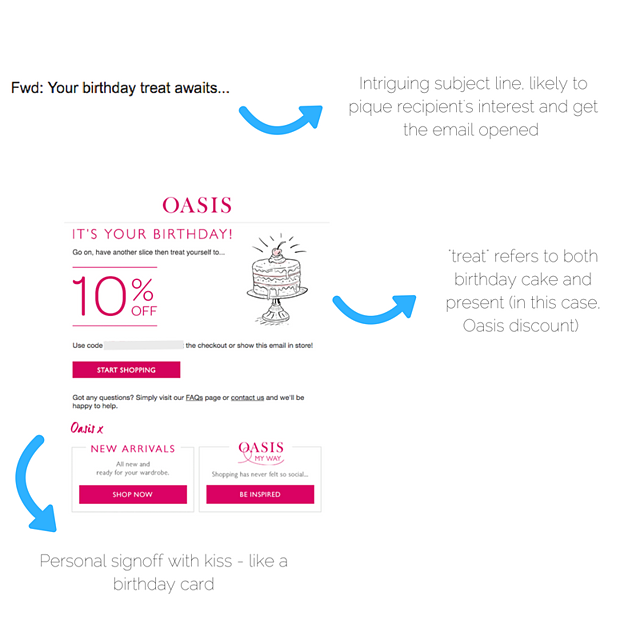 Similar to Banana Republic’s “Your birthday gift is inside!”, Oasis also piques a recipient’s interest with the subject line “Your birthday treat awaits…”. Once the email has been opened, it turns out the “treat” is both a birthday cake (albeit a non-edible one, of course) and a 10% off discount. Aside from the cake theme, what really makes this email work is its tone of voice. From “Go on, have another slice” to singing off with a kiss (“Oasis x”), this email speaks directly to a recipient and projects the sort of warmth and kindness you’d get in an actual birthday card. Idea 🎈Using past purchase history, cross-promote any products a customer has recently bought - again, this is a good way to help a recipient choose what to splash their discount on. Iconic sportswear brand Adidas has a reputation for sending great birthday emails (you can check out one example here). Perhaps because the brand knows less about this recipient, we didn’t see as much personalisation in this version, however what it lacked in bespoke content it made up for in copy and design. The super-cool, well-designed header - and the body of the template - is true to Adidas’s traditional brand colours (black and white) and made up of a long shoe lace. The copy of the email goes out of its way to make the recipient feel really special on their birthday - this is most noticeable in the “for you” after the “15% off” discount above the CTA. All of the above emails made us feel special, which is ironic as a birthday email is just a triggered email - sent automatically to a recipient on the DOB they submitted during the signup process (or later on, if your brand has a ‘personal info’ section for subscribers on site) - but this just highlights the power of the email campaign and how impactful it can be for your customers. Technically, there is nothing truly sentimental about them, and yet they still manage to communicate to a customer how much a brand cares. Even if a recipient knows it's an automated message, it doesn't matter because it's still clever, bears them in mind and they get a nice discount!